Masking Something. | Transformational thoughts…. Today I’m going to lunch with a volunteer who has worked with us in the prison for many years, through the organisation Prison Fellowship Scotland. Prison Fellowship is a worldwide organisation which Charles Colson of Watergate Scandal infamy helped to found, but that’s for another post. Our lovely volunteer has now decided to retire. She has been greatly loved by the prisoners – and by the chaplains – over all that time. And it’s been a mutual love; her family say she refers to the prisoners (some of whom are at least the same age as her) as "my boys". We didn’t want to buy her flowers which wouldn’t last, so we have bought instead a print of a piece of art produced by a prisoner. 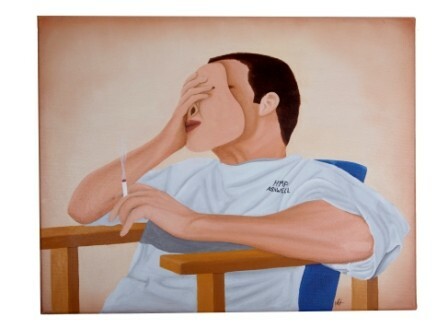 You can buy prisoners’ art here at Pictora. I’m slightly wondering where in your house you would put such a picture and whether flowers might have been safer, but I do like the image very much. It’s called "After a Visit". Here’s a question, though? Is the prisoner taking the mask off or putting it on? If he’s taking it off, what kind of mask was he wearing and why? Has ﻿he been wearing the mask with his family because he is protecting them from the reality of prison life? Has he been wearing the mask because he’s feeling down but doesn’t want them to worry about him? Has he, on the other hand, been wearing the mask with his family in quite the opposite way, exaggerating how awful everything is in order to get money, clothing, or drugs brought in? Has he been promising to turn over a new leaf when he knows he doesn’t mean it? If he’s putting it on, what kind of mask is he putting on and why? Does he feel he can be himself with his family but not with other prisoners and staff? Lots of questions and no answers – I like art like that, that makes us think. I just hope the recipient likes it as much as I do! This entry was posted in Chaplaincy, Christianity, Prison. Bookmark the permalink.